...when you're pregnant, at least. One thing I I'd always been adamant about, was that I wouldn't wear leggings as pants. That ALL changed during this pregnancy! They are pretty much all I wear around the house, and I've been wearing them outside of the house too - to work, to events, even! I've recently found the BEST maternity leggings ever in Preggo Leggings. Not only are they super comfortable, but they don't even *look* like leggings! I have the Billie Jean Moto pair and I am SO in love with them. The belly band is big enough to cover my 35 week belly, and while they fit nice and snug, they don't feel like they're too tight or constricting. For this look, I paired them with a black turtleneck, layered under a printed shirt dress and vintage wool blazer. I really had intentions to not get any (or many) maternity clothes this time around, but I'm SO happy with this pair of maternity leggings. They will be easy to dress down as well, with a pair of riding boots or sneakers, a sweater, leather jacket... so many options! 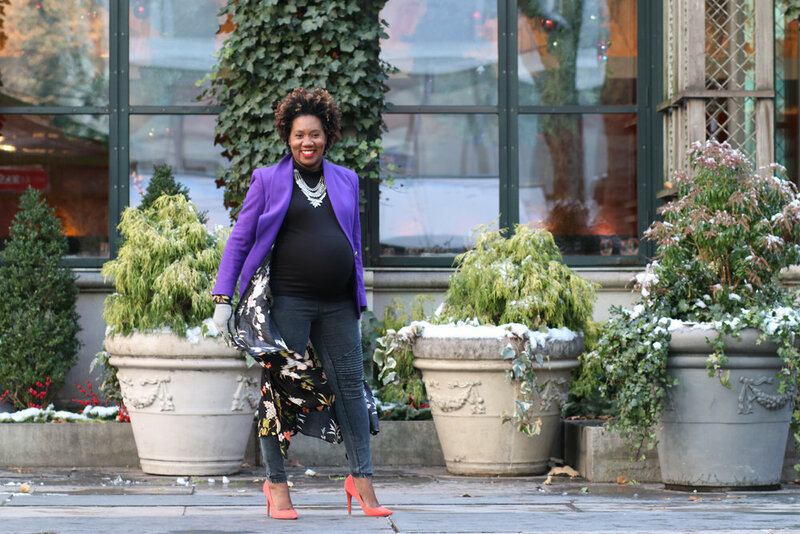 If you're looking for the perfect pair of stylish & comfy maternity pants, check out Preggo Leggings! I promise, you won't be disappointed.